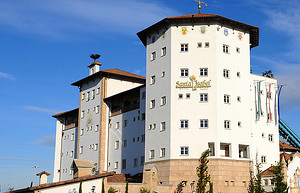 4-star Superior Hotel "Bell Rock". Apart from the hotel’s landmark, the lighthouse, an amazing journey through New England awaits you in Europa Park’s hotel. In the 4-star superior hotel “Bell Rock” you can follow the steps of the seafarers and the Pilgrim Fathers. Aim of the trip: the historical discovery of New England in the 18th century. Restaurants & Bars: "Ammolite - The Lighthouse Restaurant"
Benvenuti at Hotel “Colosseo“. Here, you can enjoy pure Italian joy of living. The perfect holiday! 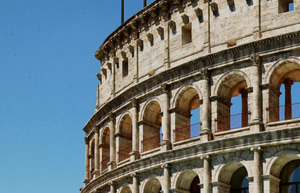 Enjoy Italian charm at 4-star superior themed hotel “Colosseo”. With a love of detail the Roman-Italian theme prevades the decorations and furnishings. Would you like to treat someone to some peace and tranquility? 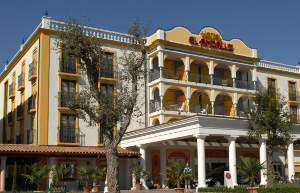 Then the hotel "Santa Isabel" is the right place. Pure romance for real pleasure-lovers. Calm and inspiration await you at 4-star superior themed hotel “Santa Isabel”. Discover a medieval fortress with modern comfort – at the Spanish themed hotel "Castillo Alcazar". An adventure for young and old alike! 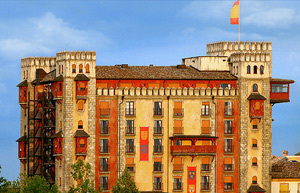 Behind the thick walls of 4-star themed hotel „Castillo Alcazar“, vaults, authentic beams and gleaming armours awaken the magnificence of past times. Bienvenido at Hotel "El Andaluz". Offer Spanish temperament in finca-style. 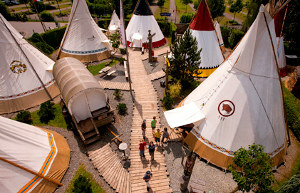 Sleep like an Indian in the tepees, covered wagons or log-cabins at Camp Resort. True Western–Feeling! Winnetou and Old Shatterhand welcome you! At Camp Resort you can sleep in authentic tepees, covered wagons or log-cabins. Please note: the beds are equipped with fitted sheets and a little pillow each. Please bring your own sleeping bags and towels. Sanitary facilities are available you in a separate building. 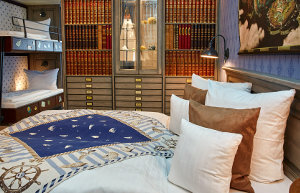 An overnight stay at the Europa-Park Hotel – “Krønasår - The Museum-Hotel” will be a very special experience for all discoverers and adventurers which are thirsty for knowledge. From the outside, the hotel resembles a Scandinavian harbour city with its typical Nordic house styled front whilst boasting a very special natural history museum insight, showcasing historic artefacts from the Adventure Club of Europe. 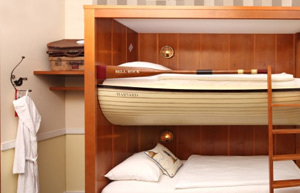 The elaborately Nordic themed rooms let visitors follow in the footsteps of great explorers and adventurous. 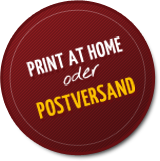 Print at home is a simple and quick way to obtain your voucher. The voucher is securely bought online and printed at home. A barcode on the voucher proves its legitimacy. Each Barcode is unique and the voucher van be used for one journey. The voucher can be opened immediately after paying in a window of your browser and can then be printed at home. For this, you will need a software able to read .pdf documents, e.g. Acrobat Reader von Adobe. Please ensure that your print at home Voucher exists only once, especially when it had to be reprinted. Otherwise there is a risk that another person redeems the second voucher and possibly devalued the barcode usable only once. The barcode of print at home tickets, after the payment could not be executed is automatically pre-locked immediately after declaration of non-payment. This has the consequence that the coupon is recognized as a locked during hotel stay on site and the redemption is not possible. You can let you send your voucher by mail to your home for free after payment. The coupon is usually the next day in the shipment and should, depending on maturity at the post office arrive not later than two or three days after posting. For safety reasons (as proof of purchase) you will receive your invoice with all important data immediately after the payment by email. For queries please contact our coupon Department at +49 7822 860-5522 contact.